Due to scheduling changes in the aftermath of Hurricane Harvey, the San Antonio Association of Hispanic Journalists’, or SAAHJ, board of directors is asking members to vote online on whether they should turn their scholarship application into a digital form. The switch from paper applications to an online system would streamline the process, board members wrote in an association email, and it would involve a funded partnership with the San Antonio Area Foundation, or SAAF. Under the proposal, SAAHJ — an organization independent of the National Association of Hispanic Journalists — and SAAF would need to sign a legal agreement and SAAF would administer a deposit of up to $50,000 in an escrow account for a scholarship fund. Scheduling challenges, a tight deadline, in addition to the amount of money involved, are why the board asked members to vote electronically by Sept. 13, the SAAHJ email said. In the email SAAHJ explains in detail the financial and administrative aspects of the agreement. Currents SAAHJ members may vote “YES” or “NO” via an email to saahj@sahipsanicjournalists.com before 5 p.m. on Wednesday, September 13. The results will be announced the following day. Isabel Sanchez has wanted to be a journalist since her youth. Today, Sanchez is pursuing a master’s degree in journalism at Syracuse University in upstate New York. There she is learning about more than the craft of news writing — she is also learning about American culture. 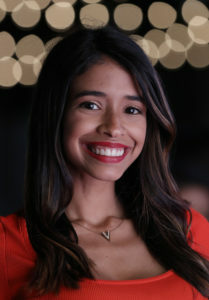 Originally from Venezuela, Sanchez studied at the Rafael Belloso Chacín in Maracaibo and worked at a local television station before coming to the United States when she was 23. Sanchez prefers to tell stories with video, which, she said, is the best way to capture someone’s attention. Her dream job is to be an international news correspondent that will allow her to continue traveling, as she has done for much of her life. Sanchez has previously made stops throughout Latin America, including Argentina and Colombia. Prior to coming to Anaheim, she had an internship in Providence, Rhode Island, with local news station, WPRI.